Who says you have to give up quality in order to save money when purchasing trash receptacles? At Securr, we are pleased to offer the ValueLine series of trash receptacles as one of our many options available. While these receptacles do not have the extra features that are found in some of our other lines, such as the ability to include advertisements for marketing purposes, these receptacles offer the same quality construction that you have come to expect from Securr. Examples of the products available within our ValueLine series are as follows. This powder-coated, 36-gallon indoor waste receptacle is made from durable, corrosion-resistant 18-gauge galvannealed steel. With their UV resistant powder coated finish, these receptacles can endure many years of use in even the harshest of indoor environments. Features include side opening doors, which allows the contents to be removed from the side instead of the top, a easy to remove rigid liner and a high-quality locking latch. This receptacle is available in black, forest brown, olive green, fir green and sky blue. 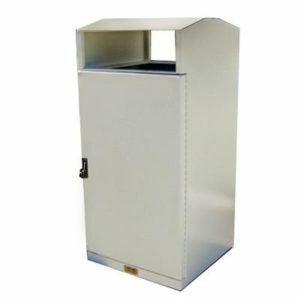 This multi-panel, 40-gallon outdoor waste receptacle is constructed with heavy-gauge galvannealed steel frames and UV-resistant powder coated finishes, allowing them to withstand harsh outdoor elements. Other features include a hinged top, which allows for easy access to the contents, and a built-in bag ring. Featuring interchangeable side panels that are bolted into place, the panels can be easily replaced in the event of damage without needing to replace the entire receptacle. Available frame colors include black, forest brown, olive green, fir green and sky blue while panel options include stainless steel and powder coated steel. Custom panel colors are available upon request, including the option to have side panels that are a different color than the frame in order to create a two-tone look. 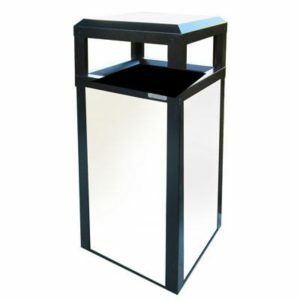 This Slim Jim, 32-gallon rectangle outdoor trash can offers a slim profile that makes it perfect for use in areas where space is at a premium or where heavy foot traffic is common. This includes areas such as airports, bus terminals, city sidewalks and walkways, shopping malls and train stations. Constructed from 18 gauge galvannealed steel with a UV-resistant powder coated finish, these ADA compliant receptacles are built to last. 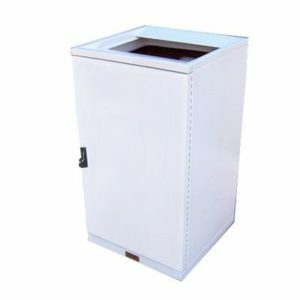 Features of the 32 gallon Slim Jim trash can include side opening doors, which allows the waste to removed from the side rather than the top, as well as a rigid liner that allows for fast and easy maintenance. A high-quality locking latch is also included. Available colors include black, forest brown, olive green, fir green and sky blue. 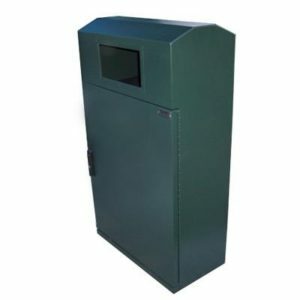 This 36-gallon square outdoor receptacle is constructed from 18 gauge galvannealed steel with a UV resistant powder coated finish, making it capable of withstanding the harshest environments. Other features include side opening doors to allow for easier removal of trash as well as a rigid liner to make maintenance easier. This receptacle also includes a high-quality locking latch and is available in black, forest brown, olive green, fir green and sky blue. When it comes to keeping your employees safe while also allowing them to work as efficiently as possible, it is necessary to give them the proper tools and materials. 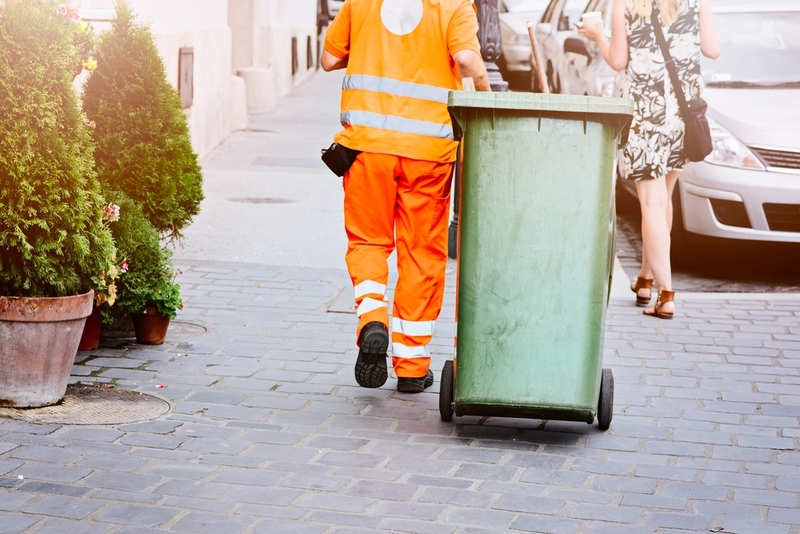 While trash removal is something that is often overlooked when making plans for a business or an organization, it is an essential component that must be addressed from a practical and proactive sort of way. Let’s face it, trash can pile up quickly. Not only is it an eyesore, but it also creates a potentially unsafe workplace or business for both employees and customers. So, how can this be addressed in the best way possible? 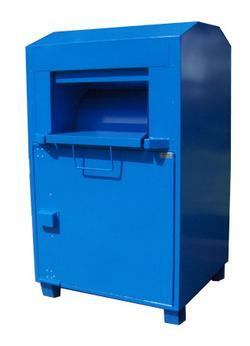 One excellent option is to purchase enclosures for your trash and recycling receptacles. As the name implies, trash enclosures are like little garages in which you park your trash receptacle. As such, they are often referred to as cart garages. While the waste does not go directly into the trash enclosure, the enclosure holds the receptacle and contains a slot through which the trash can be passed into the receptacle. What are the Benefits to Trash Enclosures? Trash enclosures offer many benefits. First, since they hold the trash receptacle inside of an additional structure, it helps to reduce the visibility of the trash. The enclosure also keeps the trash from being exposed to weather elements, thereby reducing the chance of it being blown from the receptacle or becoming soaked by rain or snow. This also prevents passersby from touching the trash, thereby reducing risk of injury. As an employer, trash enclosures also help to keep your employees safe. In addition to preventing them from being overly exposed to the waste, a trash cart can be easily wheeled in and out of the enclosure. This allows employees to empty the trash by simply pulling out the cart and moving it to where the trash is to be dumped. These carts are also specifically designed to be used in the automated trash removal process, thereby allowing you to collect an extensive amount of waste and then rolling the receptacle to the area where an automated system can dump the contents into a dumpster or garbage truck. At Securr, we are pleased to offer a variety of different trash enclosures from which you can choose, allowing you to select the size and design that best suits your needs. Options include 32-gallon, 65-gallon and 95-gallon options in either a solid body design or with the laser cut logo option. With both designs, the side panels are interchangeable and bolt in for easy replacement. In this way, if the panel is damaged, you can easily remove and replace the panel without needing to replace the entire receptacle. Both styles are also constructed with high-grade materials and finishes, including stainless steel hinges, UV resistant powder coat and galvanealed steel frames. As such, they offer exceptional corrosion resistance in even the harshest of environments. Visit the Securr website to learn more about our available trash and recycling enclosures. Despite the impact that electronics have on our every day life, many people are unaware of the impact that e-waste has on our environment. To get a better idea of the effects of e-waste as well as how you can help to control it, it is beneficial to learn more about what it is and how to collect it. E-waste is the informal name given to electronic products that are no longer considered to be useful, either because they are outdated or are no longer properly functioning. This includes items such as VCRs, televisions, stereos, computers, cell phones, fax machines, PDAs and copiers. While the Electronic Waste Recycling Act of 2003 was passed in an effort to assist with the recovery and recycling of such items, no clear definition of “e-waste” currently exists. 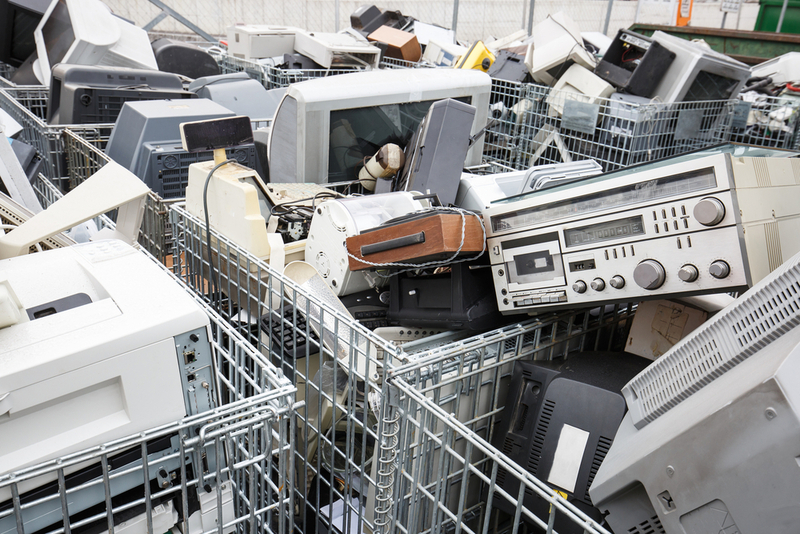 For example, whether or not items such as microwaves and other similar appliances should be grouped into the e-waste category has not been established through regulations. Since certain components of some electronic products contain hazardous materials, some e-waste products can be viewed as hazardous waste. In California, for example, nonfunctioning cathode ray tubes from televisions and monitors are considered to be hazardous. Some of harmful materials that can be found in these electronic products include cadmium, beryllium, lead and mercury. While these materials might be found in trace elements, they create a significant threat to the environment when added up in volume. E-waste can be disposed of in a few different ways. For example, equipment that is still functioning can be donated or sold to someone who might be able to use it. If it is damaged, but can still be repaired, the item can also be refurbished for additional use. For those items that cannot be repaired, another option is to recycle the product. In addition to reducing the environmental impact from the trace elements found in these products, failure to recycle these items also results in failure to recycle the glass, plastic and metals found in these items. Unfortunately, despite having the option to recycle or reuse, many of these electronic devices are still finding their way into landfills. In fact, the Environmental Protection Agency estimates that as much as 60 million metric tons of electronic waste is tossed into landfills every year. One step toward eliminating this waste is to educate the public about the need for collecting e-waste while also making the collection process simple and convenient. With the help of e-waste collection bins, the amount of waste collected can be significantly increased. At Securr, we are pleased to offer an Indoor E-Waste Collection Bin to help meet this need. Our ADA compliant e-waste collection bin is made from heavy duty, corrosion-resistant galannealed steel. As such, it looks attractive while also offering durability. With its chute-type loading door, contents can be easily dropped inside while remaining securely in place until the door is unlocked. The enclosure boasts a 40 gallon capacity, making it possible to collect cell phones, modems, computers, printers, batteries and other similar items. Are you a group or organization that is trying to collect items for a particular cause? Whether you are collecting clothes, books or other similar items, having a donation collection bin can help to make the process much easier. In fact, here are a few of the benefits associated with using a donation collection bin. With the help of a donation bin, you make it possible for people to easily make donations to your organization. Even if you have a store or an office, your hours may not work well within the schedules of people who are interested in donating to your cause. By offering a donation bin, you make it possible to collect items at any time of the day. As such, some organizations choose to place a donation bin right outside of their door. Some also choose to keep the donation box locked during their normal business hours so donators must come inside to make their donations at that time. In addition to placing donation collection bins outside of your business, you can also place them at various locations throughout your community. This helps to further increase your donations by making it more convenient for donators to make contributions. If at all possible, place these bins near popular stores or other areas that tend to get a lot of traffic. This way, donators can quickly and easily make their donations while completing other errands. Some organizations choose to use a large cardboard box or other similar items when collecting donations, but these makeshift donation bins leave your donated items open to theft. In addition, if the box is left outside, the items are susceptible to rain, snow and other weather elements. With the help of a donation collection bin, your items are kept securely inside where they cannot be easily taken by passersby. Furthermore, the collection bin can be safely kept outside with your donated items being protected from the elements. The Donation Collection Bins available from Securr provide the ultimate in protection. Not only are they lockable, but they are also made from top quality materials. In fact, every bin is corrosion and UV resistant. As such, the bins consistently maintain a professional and attractive appearance while also protecting your collected items from the elements. For added security and convenience, each of the Donation Collection Bins available through Securr are internally reinforced with a lockable latching mechanism, ensuring your items remain safely inside and protected from potential thieves. At the same time, each bin has a loading door that allows people to easily place books, clothing or other items inside without gaining access to the contents. If you are ready to start taking your collections to the next level, take a look at the wide variety of Donation Collection Bins that Securr has to offer. We are sure to have the size, color and features that you need to help make your collections a success! Whether starting a full-blown food court business or attempting to add some type of food court to an existing business, there are many factors that you need to keep in mind in order to be successful. If you are interested in setting up a food court or creating the food court experience, here are some tips to keep in mind. When looking at the space that you have available for your food court, be sure to consider how people will move in, out and through the food court area. By setting the food court up in such a way that encourages one-way traffic, you will help to keep crowding under control so people can move through the area easily. It is also important to keep enough space available for pedestrians to walk while carrying trays without fear of bumping into other people or items. Food courts experience a great deal of traffic during certain peak times, which are primarily around breakfast, lunch and dinner times when most people’s stomachs are programmed to become hungry. Outside of these peak times, you may not need to have a great deal of seating. During peak times, however, you will need to be sure to have adequate seating to meet the needs of those who will be visiting the food court. If you are setting up a food court for your employees, you should have a rough idea of how many people are likely to visit the food court during peak hours. 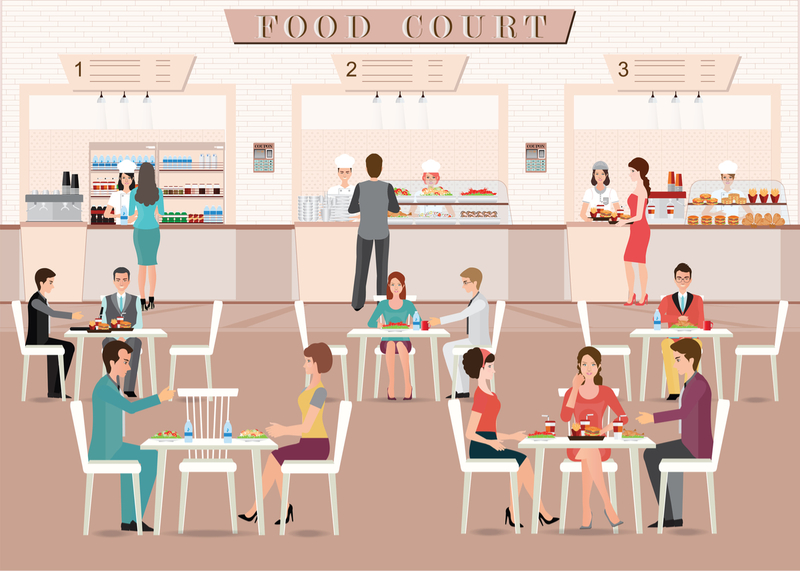 If you are installing a food court in a public area, such as in a mall, determining these figures can be a bit trickier. By providing your customers with easy-to-use receptacles that are placed in strategic locations, you can limit the amount of work that you have to put into cleaning up after those who have dined at your food court. The food court waste receptacles available from Securr help to make this possible. Designed specifically for high-volume food courts in both indoor and outdoor areas, our receptacles are made from corrosion-resistant steel and feature a top that is specifically designed for holding dirty trays until they can be retrieved for cleanup. Our food court waste receptacles also keep the waste enclosed and safely locked away. In this way, the waste remains inside the container until you are ready to pull out the receptacle and remove the waste. This innovative design also helps to alleviate stress on your back as the waste is easily pulled out rather than up from the receptacle. If you are creating a food court in a busy downtown location, offering a wide variety of food types may be a good idea. By offering pizza, chicken, Mexican, Oriental and other types of foods, you are more likely to please a wide audience of customers. If you are installing a small food court in at your business for employee use or for a small group of customers, however, it is generally best to keep the selections simple. Keeping employees safe in the workplace is of the utmost importance for employers. 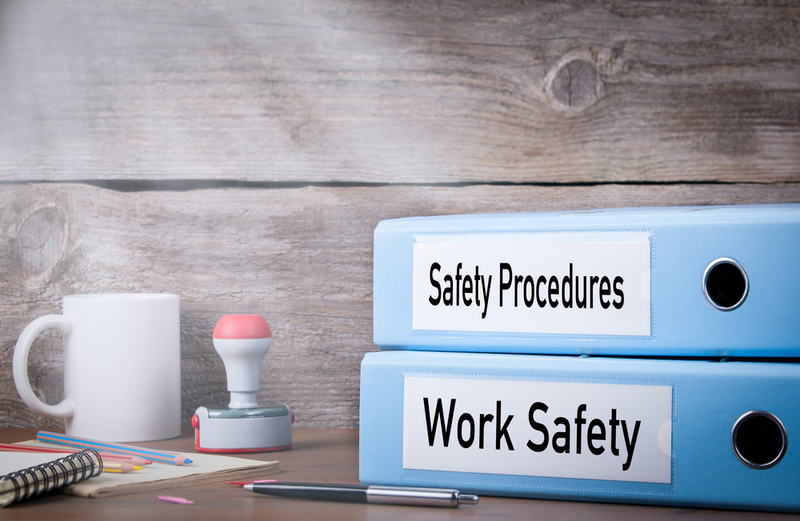 Not only do you have to follow OSHA guidelines to avoid fines, but workplace safety also lets your employees know that you care. Keeping your employees safe and healthy also ensures they are able to perform their jobs properly without needing to find replacements. So, how do you keep your employees safe? With these guidelines, you will be sure to create a safer work environment. Awareness should be a key component of your safety plan. By having regular safety meetings and addressing potential issues with your employees, you help to keep safety at the forefront of their minds. If everyone is vigilant about safety and addressing potential dangers, the entire workforce is safer. Asking an expert for advice on how to make your workplace safer can be enlightening. Often, simple things that you may have overlooked can make a significant difference in creating a safer work environment. Furthermore, little changes such as using trash can cart enclosures can help to increase safety in the workplace. In addition to keeping the trash out of reach, a trash can cart enclosure makes it easier to remove the refuse without creating unnecessary back strain. After assessing your workplace and coming up with potential solutions, you will need to develop a plan to implement your new safety measures. While some safety measures may be expensive, others may be relatively inexpensive or possibly even free to implement. For example, holding regular safety meetings with your employees to review safety measures will only cost you about 15 minutes of your time. Starting off each shift with a quick review of the proper safety measures will ensure safety is at the forefront of each of your employee’s minds. While you may be concerned about the lack of productivity for those 15 minutes, the payoff will be greater when your employees remain safe and uninjured. Once you have created a plan that you believe you can follow, it is time to start implementing the new safety measures that you have developed. Be sure to look at all pricing options when purchasing new equipment or materials to assist with safety. 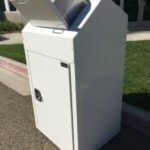 If you are purchasing trash can cart enclosures from Securr, for example, you can qualify for reduced pricing when you purchase 25 units or more. While not all workplaces require this many trash receptacles, larger businesses can save while increasing the safety of employees by taking advantage of these bulk prices. While you have taken all of the proper steps to have your workplace analyzed so you could create a great plan, things change over time. In addition, as safety becomes more of a priority for your employees, more methods for improving safety may come to light. Regularly reviewing your safety plan and making adjustments as necessary will ensure you are continually improving the safety for everyone in your workplace. When it comes to removing medical waste waste, it is important to know that there are four major types of medical waste that need to be dealt with. These include: Infectious, hazardous, radioactive and general. 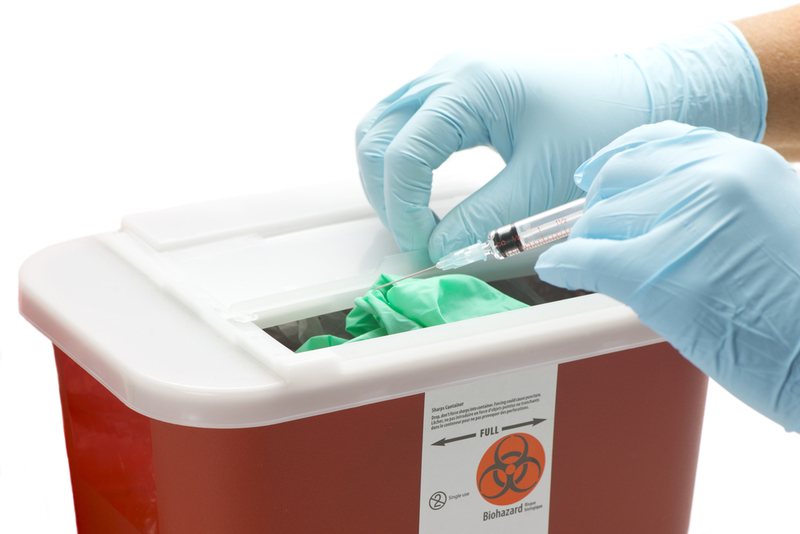 By understanding these various forms and considering your needs, you will be better able to determine which type of medical waste containers are best to meet your needs. Much of the waste that falls into this category may also be pathological waste, which means it contains either known of suspected pathogens. Hazardous waste can also include chemicals, both industrial and medical, as well as certain items that can be considered infectious depending upon its usage and exposure to human or animal tissue prior to being discarded. These items include old drugs and chemotherapy agents. Radioactive waste is waste that can be generated from cancer therapies, nuclear medicine treatments and medical equipment that uses radioactive isotopes. Pathological waste that is contaminated with radioactive material may be treated under this category rather than as infectious waste. At least 85 percent of all waste generated at medical facilities is considered to be general waste. General waste is no different from general office or household waste. As such, it includes items such as liquids, paper and plastics that do not fit in the other three categories. While pathological waste is included in these categories, it is also designated separately due to the potential psychological impact it could have on observers. Waste that comes from a living organism is typically pathological waste. This includes recognizable tissue, body parts and organs from humans and animals. Materials that have been removed from the body during surgery and solids and fluids that are removed during autopsies are considered to be pathological waste. Teeth, however, are not included in this category. This type of waste is almost always treated by incineration. The term “regulated waste” is used to refer to bodily fluid waste as addressed in safety standards and procedures described by OSHA. OSHA’s Bloodborne Pathogen Standard requires businesses to have an Exposure Control Plan in place to protect workers and minimize the chances of transmission of hepatitis C, hepatitis B and HIV. OSHA requires that regulated waste be placed in closable containers. With the help of aluminum producers and recyclers, the public and other businesses are able to enjoy curbside and industrial recycling services. While there are many items that can be recycled, aluminum recycling is one of the most common types of recycling. Aluminum can be recycled from a variety of areas, including soda cans, wire, window frames, tubing and electronics. Yet, despite the fact that aluminum is so commonly recycled, many people know very little about this material. Here is a look at some interesting facts that you might not know about aluminum and aluminum recycling. In addition to being the most recyclable of all recyclable materials, aluminum is also more valuable than other items in the recycle bin. Yet, despite the value of this material, Americans throw away nearly $1 billion worth of aluminum every year. 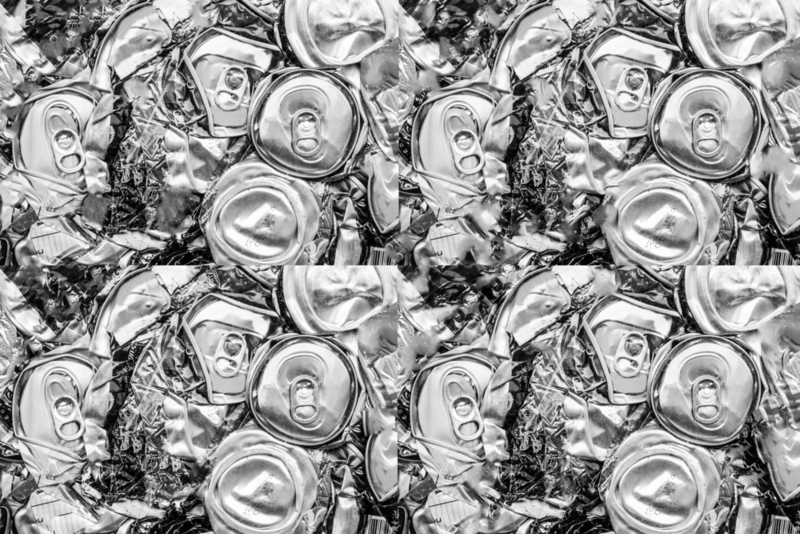 On the whole, the recycling rate in the United States is just at about 67 percent, with the aluminum industry paying out more than $800 million a year for recycled cans. Each of these recycled cans helps to reduce the overall toll of the aluminum industry on the environment, as recycling just one can saves enough energy to listen to one full album on an iPod. This is because recycling saves more than 90 percent of the energy that is required to produce new metal. Aluminum recycling has been in practice for many years in the United States. In fact, aluminum foil played a vital role in the defense effort during WWII, with families encouraged to save stripes of foil. In many towns, the foil balls could be exchanged for goods and services such as being admitted for free to the movie theater. Government-sponsored ads, radio shows, posters and pamphlets urged Americans to contribute to these aluminum scrap drives. A number of different methods are used to recycle aluminum. Curbside and municipal programs are the most commonly recognized methods for recycling, with these programs recycling items such as aluminum foil, beverage cans, pie pans and baking trays. The aluminum industry supports the Recycling Partnership, which is dedicated to helping to increase participating in curbside recycling programs. Building and automotive parts are also collected for recycling. More than 90 percent of the aluminum in building and automotive parts is recycled when it is no longer in use. Regardless of how the aluminum is collected, it is all sent to aluminum recyclers who then melt down the aluminum so it can be used in the secondary production process. The melted aluminum can then be recycled directly back into itself to be used over and over again. As a result, nearly 75 percent of all aluminum produced in the United States is still in use today. Since aluminum can be reused in a closed loop process, it pays for itself to be recycled. As such, the demand for aluminum continues to be high. Therefore, not only does aluminum recycling help to protect the environment, but it also increases the ability to increase profits. Placing an advertisement on an advertising receptacle can be an effective way to build brand loyalty and to gain new customers. When creating a sign for your receptacle, however, it is important to keep a few tips in mind to help ensure the greatest success from your ad campaign. Rather than using stock photos that your customers have likely seen over and over again, spend a little more money and invest the time in having a photo taken just for your ad. An eye-catching photo that truly captures the essence of your business will go a long way toward helping you create the image you wish to develop. While your logo should be incorporated into your ad, you should avoid using it as the main feature of your ad. Including it will help to increase brand recognition, but there is no need to make your logo the main feature of your ad. Instead, focus on the message that you wish to convey to your target market. Your ad should utilize all of the space that is available without cutting it off so that parts of it cannot be seen. Get the exact dimension of the display window of your receptacle so you can be sure to get the exact dimensions for your ad. With this information, you can tailor your ad to be exactly the right size. If in doubt, add a border around the ad as filler. This way, if part of the ad is cut off, you will only lose part of the border. On the other hand, if there is more visible space than you anticipated, the border will help to frame the ad in an attractive manner. An advertisement on the side of a trash receptacle should not be filled with numerous words. Keep any words short, simple and to the point. Remember, the idea is to capture your market’s interest so they will contact you to learn more, not to cram as much information as possible on to your ad. The location of the receptacle on which you are advertising will have an impact on the final design and message that you try to convey with your advertisement. An ad on a receptacle at a public park, for example, will reach a different type of audience than an ad on a receptacle at a car repair shop. 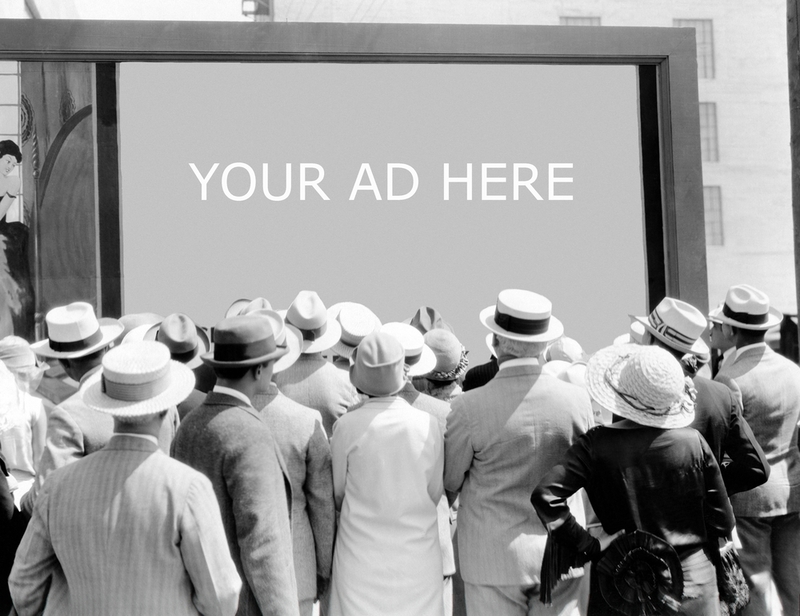 Consider who will be likely to see your ad and create your advertisement with that target audience in mind. If you wish to advertise on multiple receptacles, you may need to create a different ad for each receptacle in order to best reach your target audience. At Securr, we have many different types of advertising receptacles available, including convenience store and gas station island advertising trash cans & recycling bins. For those who are just looking for the basics, we also have logo trash cans & recycle bins available. With Halloween right around the corner, you may be feeling quite excited about the upcoming parties, costumes and treats. 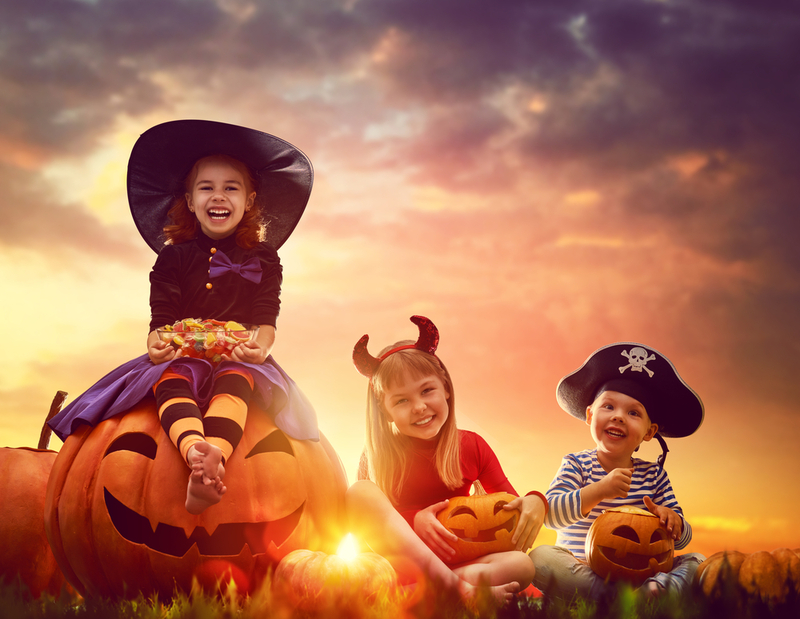 While Halloween is certainly a very fun time of the year, it also has the potential for creating a whole lot of unnecessary waste that can be easily avoided with a little forethought and planning. Here are some ways to get into the Halloween spirit while still doing your part to keep the planet clean. Rather than purchase a plastic candy container that will likely be thrown away after the holiday is over, consider using a pillowcase instead. A pillowcase can be easily washed and put back to its original use after the trick-or-treating is over. It is also capable of holding plenty of candy and is not likely to break or form a hole while walking from house to house. If you don’t want to risk ruining a pillowcase or if a pillowcase seems to cumbersome for your child, you can make your own candy container by cutting the top off of a milk jug and decorating it before heading out for trick-or-treating. With the help of a permanent marker and a little creativity, you can transform your milk jug into a jack-o-lantern or a friendly ghost. After trick-or-treating is over, you can put your milk jug in your recycling container along with all of your other recyclables. Halloween costumes are often made of cheap material and are worn only once. Rather than spend the money on something that you will just throw away at the end of the day, consider creating your own costume from items that you already have at home. This is also a great way to create a unique costume that others are not likely to have. For example, you can transform yourself into a jellyfish by attaching strips of bubble wrap to the outside of an umbrella and carrying it over your head. Or, use cardboard boxes to transform yourself into a robot or even a sand castle. You might be surprised by the great decorations that you can create from items that you would otherwise throw away. Jars from spaghetti sauce, pickles and other food items can be cleaned out and painted with Halloween décor. Add a candle inside to create a spooky glow. Creating your decorations beforehand can be a fun family activity that adds a personal touch to your holiday. Rather than throw away all of the candy wrappers from Halloween, challenge the family to save them. Once all of the candy is consumed, look into programs such as Terracycle to recycle your wrappers rather than send them to the landfill. Or, if you are feeling extra creative, look for ways to use your wrappers to create something new. At Securr, we offer a number of different receptacles that are meant for recycling. Whether you need smaller receptacles or large multistream recycle bins, we are sure to have an option for you.